Yes, it has a WebServer internally too. One of the internal services, ContainerManagerImpl extends CompositeService and implements ServiceStateChangeListener, ContainerManagementProtocol, and EventHandler interfaces. It contains event handlers called ResourceLocalizationService and ContainersLauncher. As you can see in the class definition of ResourceLocalizationService, it implements EventHandler interface to handle LocalizationEvent type. ContainersLauncher is the event handler responsible for initialization, starting, launching, and termination of containers. It implements EventHandler interface to handle ContainersLauncherEvent type, eg. LAUNCH_CONTAINER, RECOVER_CONTAINER, CLEANUP_CONTAINER events. ContainerManagerImpl registers the above event handlers as shown below. In addition, it also registers other event handlers to listen and handle ContainersMonitorEvent, ContainerEvent, ApplicationEvent, and AuxServicesEvent. In NodeManager, it has an important class called DefaultContainerExecutor which extends ContainerExecutor. This DefaultContainerExecutor provides the methods to activate and launch container. This class is used by both ResourceLocalizationService and ContainersLauncher. Both ResourceLocalizationService and ContainersLauncher are instantiated in ContainerManagerImpl. activateContainer, launchContainer used by ContainersLauncher whereas method startLocalizer is called by ResourceLocalizationService. After a container is created, the required artifacts for the job have to be downloaded first, this is what we refer to as localization in YARN. Localization is to download remote resources onto the local file system. You can check out this excellent blog post by Hortonworks about resource localization. I will blog post about resource localization next time. Stay tuned. I will continue to add more infos as I learn and discover more about their differences. 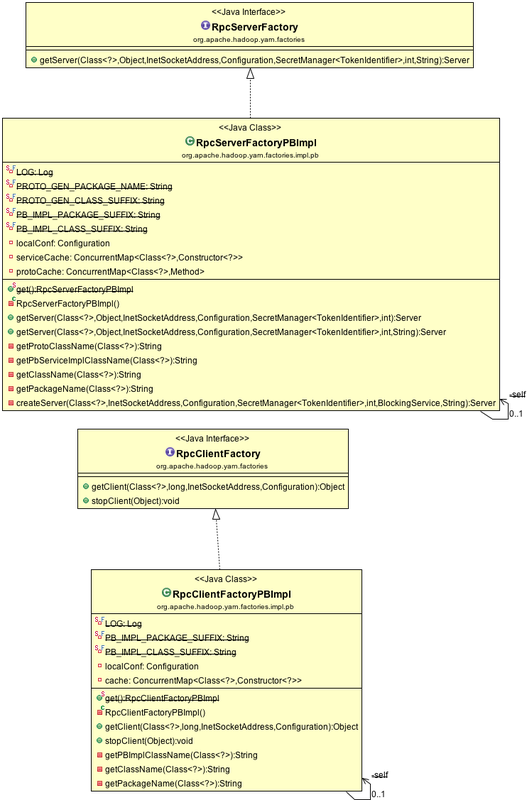 YarnRPC is the abstract base class that defines several abstract methods to return RPC client proxy and RPC server. HadoopYarnProtoRPC extends YarnRPC to provide concrete implementations to the defined abstract methods. Inside HadoopYarnProtoRPC, it uses RPCFactoryProvider which acts as a Singleton Factory to return different implementations of RPCServerFactory and RPCClientFactory interfaces. Currently, we have RPCServerFactoryPBImpl which implements RPCServerFactory interface and RPCClientFactoryPBImpl which implements RPCClientFactory interface in YARN. These PB factories in turn allows us to inject different Protocol Buffer protocol implementations based on the protocol class in the creation of RPC server and client proxy by the underlying Hadoop RPC. In the last post, we looked into the Yarn event structure. 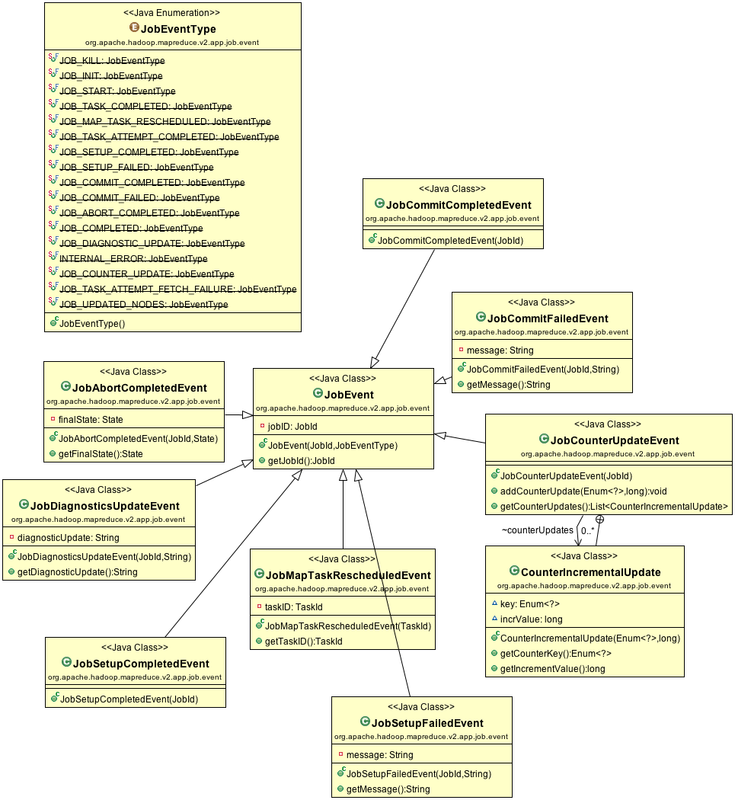 Today, we will look at different events introduced in MapReduce V2. These events are defined in the org.apache.hadoop.mapreduce.v2.app.job.event package. 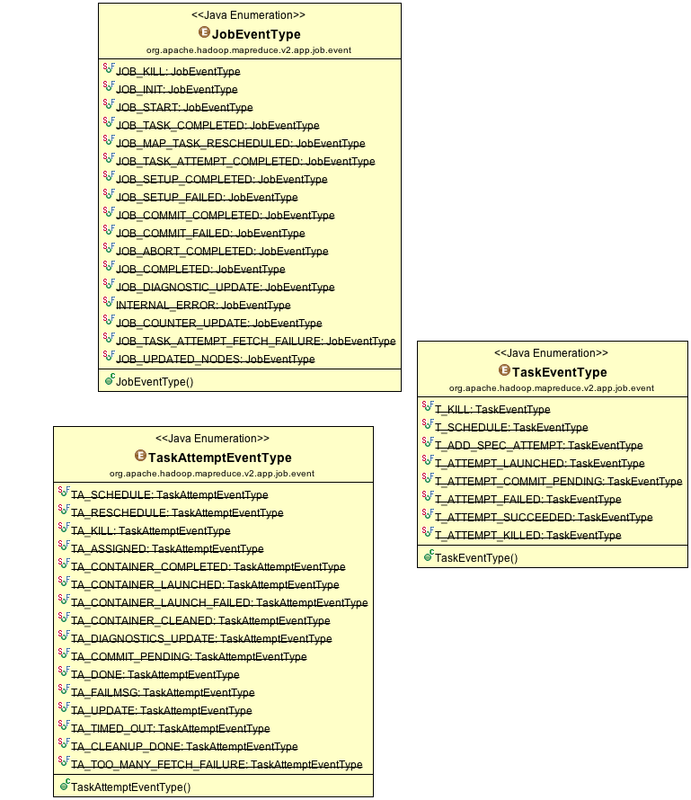 You will find different event types defined in the JobEventType, TaskEventType, TaskAttemptEventType enum classes. * Event types handled by Job.